Professor Mark Lakirovich is one of the most sought-after violin pedagogues today. He is a member of string faculty at Longy School of Music, Longy Conservatory and preparatory school of New England Conservatory in Boston, and Artist-Teacher at the Chicago College of Performing Arts Roosevelt University. 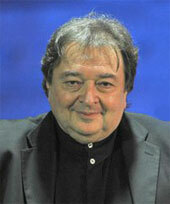 He is a Visiting Professor of violin at Kiev International Summer Music Academy, Ukraine. Mr. Lakirovich travels extensively giving master classes in the US, Canada, Germany, Russia, Ukraine, Mexico, and Australia, and he is frequently serves as an adjudicator at various national and international competitions. His former students performing as soloists and chamber musicians, working in professional orchestras in Australia, Europe, Asia, and the US. Many of them have also become fine teachers and now teaching in various schools, pre-colleges and colleges around the world. Among his students are several winners of national and international competitions. As a soloist, conductor, chamber and orchestral musician, Mr. Lakirovich has performed in concert halls of Europe, Israel, former Soviet Union, Australia, and the US, and at major music festivals, including Salzburg, Vienna, Paris, Geneva, Lucerne, and Madrid. He served as Associate Concertmaster with Queensland Theatre Orchestra and as Concertmaster with Queensland Pops Orchestra Australia, and is former member of Beer Sheba Chamber Orchestra Israel, Stuttgart Philharmonic Orchestra and Stuttgart Philharmonic Trio Germany. Mr. Lakirovich made numerous recordings, and radio broadcasts for Sud-Deutsche Rundfunk Stuttgart, ABC and 4MBS Australia, Radio Vatican, and Ariola and VOX labels. He had several television appearances on Channels 7, 9, 10, and ABC Australia. Mr. Lakirovich was Co-Founder and Principal of the Stoliarsky School of Music in Brisbane and Sydney, Australia; string faculty of Sydney Conservatory of Music University of Sydney, Australian Institute of Music, and Stuttgart School of Music Germany. Prior to his appointment at the Longy School of Music, Mr. Lakirovich has served as Associate Director, Education, and Music Director of the Special Music School at Kaufman Center New York City, and Executive Director of t he Ann Arbor School for the Performing Arts Michigan. Mark Lakirovich holds Diploma with Honors in Performance and Teaching from the Azerbaijan State College of Music Baku, Graduate Performance Certificate in Violin from Music Academy Jerusalem Israel, and Concert Artist Certificate from Lucerne Conservatory of Music Switzerland.